A woman who was talking to her friend in Spanish was attacked and told to speak English in a racially aggravated assault. 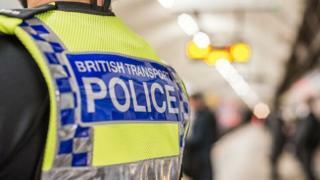 Two women shouted at the 24-year-old when she was on a Central line train on the London Underground on 7 April, police said. The victim was pulled around by her hair, which resulted in injuries to her scalp and cuts to her face. British Transport Police said the women were black and had braided hair. They are believed to be in their late 20s and one was wearing a brown jacket, while the other was wearing a black jacket. A police spokesperson said the women shouted at the victim, "saying she should be talking English when in England". The train was travelling from Liverpool Street to Stratford when the assault happened at about 03:45 BST. Police said officers are looking at CCTV from the stations and would like to speak to any witnesses.